Sign up for Broadjam today to follow Craig Moxey songwriter/producer/guitarist, and be notified when they upload new stuff or update their news! 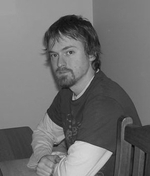 Craig Moxey has been writing, performing and producing music for over 10 years. He hails from Melbourne Australia He is a prolific songwriter and an accomplished musician. Craig writes for many genres including pop, rock, folk rock, R&B and heavy metal. His songs include a range of touching ballads to thought-provoking metal songs. Craig hopes to visit the USA to gain more insight and experience in the music business.